I don't about you, but being a special education teacher, I tend to run a lot of small groups during the day. 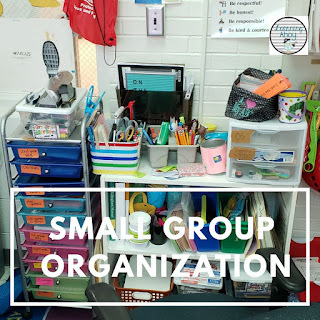 While running groups, I have little to no transition time so everything has to be ready and at my finger tips. The first way to do this is good planning. I have a weekly planning sheet for each group. Nothing grand, but it works for me. Next is your set up. I have a set of 10 drawers and each drawer is labeled. 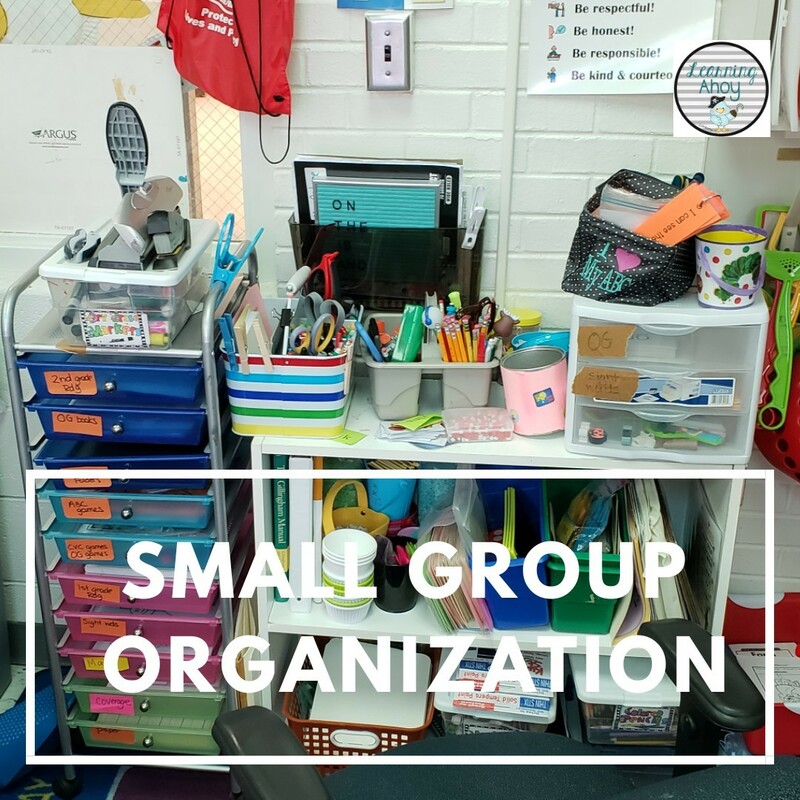 In the drawers are activities by group, various alphabet activities, the books for my Orton-Gillingham/Wilson assessments, paper, and other resources. This makes it easy for me to grab what I need quickly. On the white shelf, I have a plethora of materials. 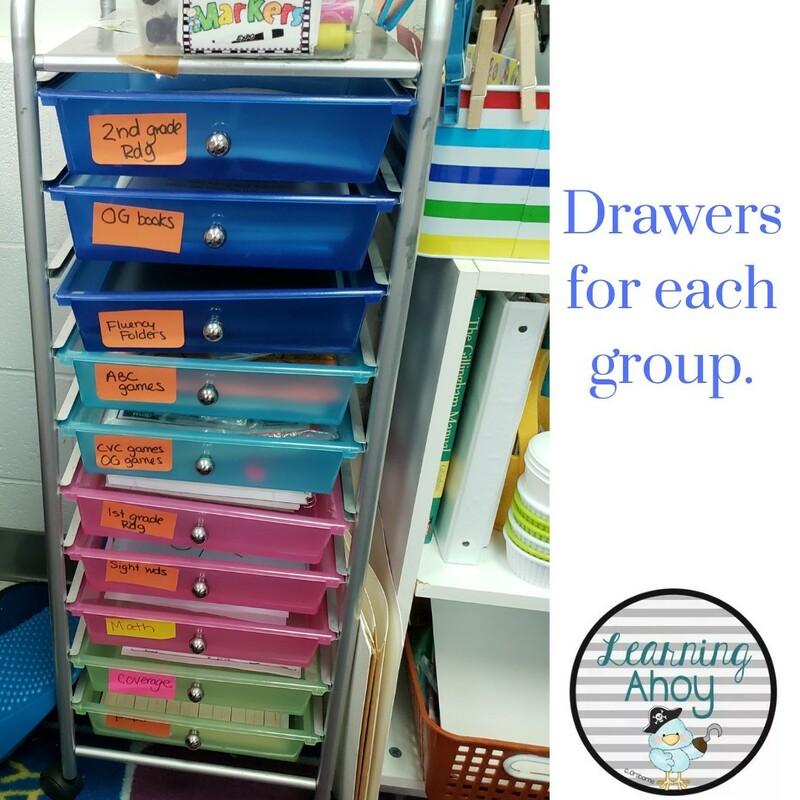 The small drawers hold letter and word card for quick drills for each group. On the very top is a utensil organizer I found in the clearance section of target that I use to keep pens, pencils, glue, scissors and those kinds of things that I need to use. 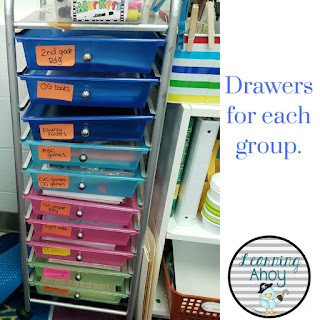 I also have a small 9 drawer organizer where I keep brads, paperclips, binder clips, etc. The little containers hold reinforcers (because in special education editable reinforcers are often a necessity). On the middle shelf, I have white bards, games, dice, and "teacher" books. 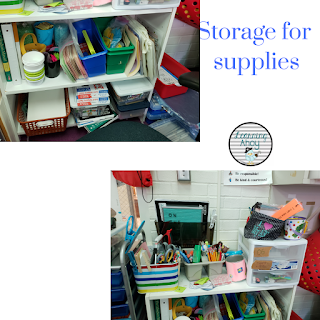 On the bottom shelf, I have a basket with my gel boards, a basket of whiteboard markers, colored pencils, crayons, and a box with my word cards. So that is it, everything is all over the place, but I can get to it and use it quickly which is what I need. I find that by the end of the week, my space is a disaster area so cleaning up after myself is always needed.